The perfect choice for the Shake/Sundae decision. 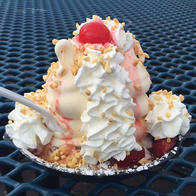 We combine your favorite Shake with your favorite Sundae and then cover it with whipped cream, nuts and a cherry. Two heaping mounds of ice cream, one vanilla and one chocolate, smothered in hot caramel and chopped pecans, then covered with a hard chocolate dip, whipped cream and a cherry. Two heaping mounds of ice cream, one vanilla and one chocolate, covered in delicious hot fudge topping with whipped cream, nuts, and a decadent chocolate brownie. Two heaping mounds of ice cream, one vanilla and one chocolate, drenched in hot caramel and hot fudge topped with whipped cream, pecans, and a cherry. Two mounds of vanilla ice cream twisted with pineapple flavorburst drowned in pineapple topping and marshmallow sauce, then topped with shredded coconut, whipped cream, nuts and a cherry for tropical taste. Two mounds of chocolate ice cream topped with marshmallow sauce, hot fudge, nuts, whipped cream, and a cherry. An old-fashioned taste done right. Two mounds of vanilla ice cream piled on top of a slice of scrumptious pound cake with ladles of fresh strawberries, whipped cream, and a cherry. 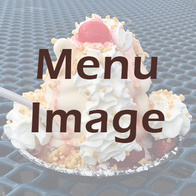 A splendid warm and crispy funnel cake with powdered sugar and hot fudge underneath two tall mounds of vanilla ice cream smothered with strawberries, whipped cream, nuts and a cherry. Vanilla ice cream layered with strawberries, pineapple, and chocolate syrup. Vanilla ice cream layered with hot fudge, salted Spanish peanuts, and topped off with a hard chocolate dip coating. Vanilla ice cream layered with peanut butter sauce, crushed Reese's Pieces, and hot fudge topped with a hard peanut butter dip and chopped peanuts. Banana Split: The original-one mound of chocolate sandwiched between two mounds of vanilla topped with an ample amount of chocolate syrup, strawberries, pineapple, whipped cream, nuts, a cherry, and of course a whole banana. Fudge Split: We hold the toppings from the original banana split and flood it with our delicious hot fudge, barely leaving room for the banana, whipped cream, nuts, and a cherry. Cup Split: The same delicious concoction of ice cream and toppings as our original banana split but layered into a tall cup, great for those who want the luxurious taste of the original with less mess. Jumbo Split: Warning: not recommended to be eaten without parental supervision. Two of our original banana splits made side by side, topped off with a large mound of strawberry soft serve followed with even more strawberries, then of course covered in whipped cream, nuts and cherries. 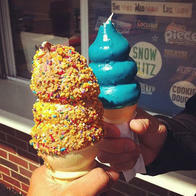 Dairy Star offers a wide variety of ice cream treats that are fun for the whole family! Stop by for a cone!